Marshall Breakstone is always the bridesmaid and never the bride. A 40-year veteran of the local blues and rock circuit, dude has played sideman to some of Vermont’s most notable blues hounds — most recently Dave Keller and Blue Fox. But until now, Breakstone has rarely claimed the spotlight for himself. His recently released solo album, I for One, finally unveils a unique talent. While not a perfect attempt, the album introduces an unusually irreverent songwriter who can take his place among the state’s legion of quirky tunesmiths. Breakstone indulges his blues roots on the opening cut, “Slow Day for the Blues.” Breakstone wrote, recorded and performed every note on the album and proves a gifted multi-instrumentalist. With veteran guile, he keeps his accompaniment on bass and drums sturdy but simple, allowing space for his guitar chops to shine. Here Breakstone delivers tasteful blues lines with expert precision and feeling. As a vocalist he is equally sharp, if somewhat reserved. Though not blessed with a particularly expressive voice, his plainspoken delivery gets the job done. Breakstone stumbles in more ambitious moments, such as “Say It With Food,” a clunky ode to a canine friend that falters under a heavy-handed metaphor about loyalty. The reggae-tinged “You Gotta Go There” is another misstep, derailed by a surprisingly sloppy programmed drumbeat that never syncs with the live instruments. The result is a mishmash compounded by trite wordplay. But plenty of other songs raise the bar. “The Stoneder You Are” is a genuinely amusing riff on the perils of playing high, complete with heady, sitar-like guitar and cheesy, sci-fi percussion effects. “Beer and Ibuprofen” is another charmer, a tongue-in-cheek explanation of just how an aging rocker manages to keep going, night after night. “Excuse Me for Living” is a sarcastic, noodle-y slow jam. And “It’s Bad to Get Eaten” is a joyously silly romp warning against the dangers of becoming shark food. Sage words, to be sure. I for One may not become a local classic, even if Breakstone is one himself. Still, it’s an entertaining disc from yet another singular Vermont songwriter. 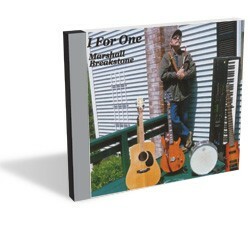 Marshall Breakstone’s catalog is available at the Vermont Music Library & Shop.